Following my request for “Kulango” spoons that arrived in Europe before 1987 (read the original post here), I received pictures from a reader of a spoon (see below, height: 27 cm) which arrived in a German monastery in 1967. It was collected before that date and it’s condition clearly shows it was probably already a couple of decades in use before it was collected. The inventory card – which clearly identifies it as Ashanti – also stated this spoon was used as a pestle. At present, the oldest documented example ! Image courtesy of the Grace Collection of African Art. This entry was posted in Objects and tagged Ashanti on October 19, 2013 by admin. These spoons have always been one of my favourite household items from Africa. Their design surpasses the purely utilitarian character of many other examples. Presented on a pedestal, it is a wonderful form. 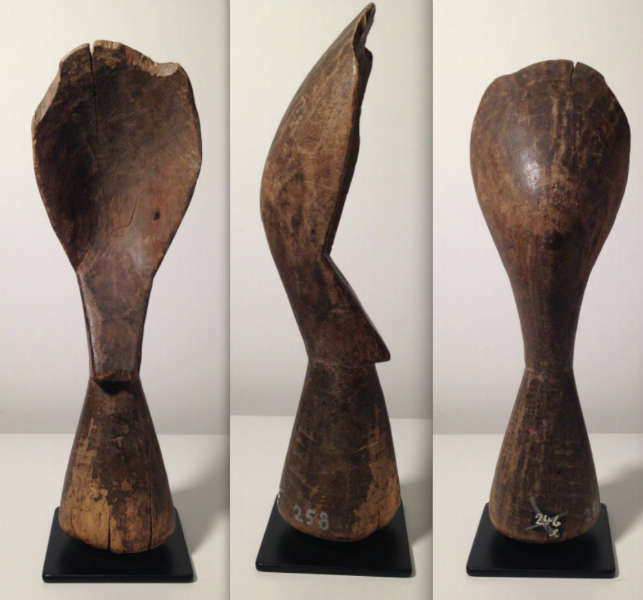 In 1988, Jacques Kerchache, was the second to publish such a spoon in his magnus opus L’Art Africain (p. 377, n° 336). Among the hundreds of objects illustrated in this book only one is purely non-figurative: a single voluptuous spoon identified as Kulango. Gérard Berjonneau and Jean-Louis Sonnery had published it one year before in their book Rediscovered Masterpieces of African Art (1987, p. 270, no.273). In 2010, this particular spoon was sold by Sotheby’s for € 78.750,- (info, see above). A similar spoon, again identified as Kulango, fetched thirteen thousand euro in the famous Goldet auction of 2001 (lot 223). It was also published by Christiane Falgayrettes in the exhibition catalogue Cuillers-Sculptures (Paris: Editions Dapper, 1991: p. 68). Not suprisingly, these spoons have become very popular ever since and in recent years it became fairly easy to find examples in the trade (often at very fluctuating prices). More than a dozen got published, always identified as Kulango. Except for the small, slender example which pre-date them, they were all collected in central Ghanaian villages between 1990-2006 by friends. Each example is well used and varies subtly from the next in age, wear and form. They are used in the kitchen. Amyas Naegele informed me that Michelle Gilbert, an art history professor at Trinity College in Connecticut, has been doing field research in Akwapim, an Ashanti town, for decades. She bought several examples locally and insisted they were Ashanti. 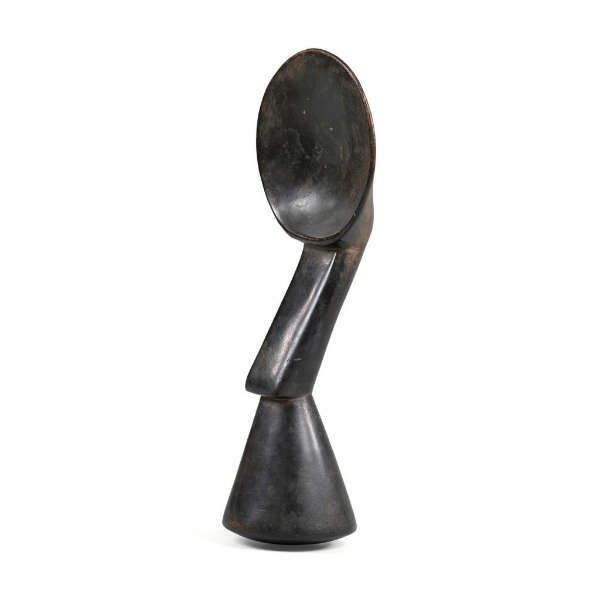 Additional, multiple trustworthy Ghanaian art dealers brought many of these spoons to the US and always described them as Ashanti ! 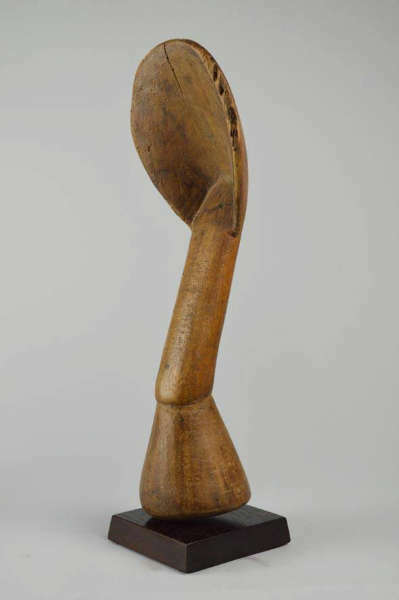 It is possible that the Kulango also made such spoons but the form shows relatively little variation – certainly not the kind of variation one would expect over an area ranging from Akwapim to Kulango country. The falsehood about the origin of these spoons spread against a background where there was no information and no expertise and certainly no contradicting information. Unfortunately this kind of thing is extremely common in our field. Lastly, these spoons might not be a very old tradition – the first example only being published in 1987. Do let me know, if you are aware of earlier mentions ! Update: a spoon collected before 1967 here. Image courtesy of Amyas Naegele. This entry was posted in Objects, Research and tagged Ashanti, Kulango on October 8, 2013 by admin.